Update your blog with one of the 10% off banners. Make sure you insert your affiliate link as the banner URL. Include your affiliate link and the discount code JAN2013 in the first line of your YouTube description box. 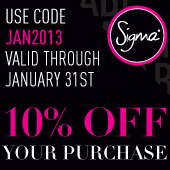 Share the code and your link with any Sigma related blog posts. Get the latest banners below! Just posted on my Blog! Thanks! CurlyGirlBeauty.org! will there still be a free give with $30 purchase in January? If so what will it be? Yes! The new free gift for purchases over $30 will be single eye shadows! What's the free gift with over $30 purchase? The new free gift for purchases over $30 in January will be single eye shadows! Just posted the banner on my blog! Hi Nikki! At this time we will not be sending out products this month. 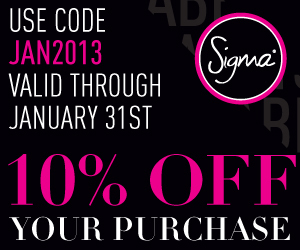 Please contact affiliate@sigmabeauty.com with additional questions! Done! Thanks for always keeping us in the loop! Got it uploaded to my Home page and my beauty page :) Need to keep on top of this, didn't do much with it the end of last year but 2013 is brand new so hoping for good things! !